CHANTILLY, VA, January 3, 2017 -- The City of Norfolk has launched a car sharing program aimed at slashing costs, reducing fuel consumption, and creating a “culture of sharing” within the city. The announcement was made today by Agile Fleet, the City’s fleet management solutions provider. City of Norfolk Fleet Maintenance Manager, Facundo Tassara, says that the city will reduce its fleet size and expenses by eliminating older, underutilized vehicles while turning over the remaining vehicles to their new motor pool. “By creating a motor pool at City Hall and requiring departments to share, I have been able to recommend eliminating five of 12 vehicles and reassigning the rest to departments that need vehicles,” says Tassara. 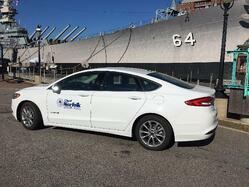 Eliminating underused vehicles has enabled the city fleet to purchase six new alternative-fuel vehicles for the motor pool. “These vehicles will help us greatly reduce fuel consumption and costs,” he says. “The City of Norfolk is using taxpayer dollars better by taking control of their fleet and concentrating their efforts on sharing. We are proud to help city employees improve management of their existing assets, as well as save fuel by now using the newer, fuel-efficient vehicles. It’s a win-win,” says Ed Smith, President of Agile Fleet.